In yet another confusing move, the Sacramento Kings, who drafted Ben McLemore in 2013, reacquired his rights in a trade that sent Garrett Temple to the Grizzlies. 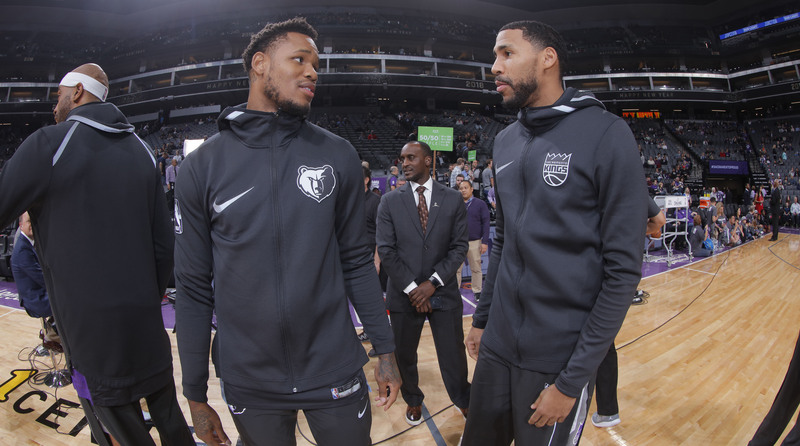 The Grizzlies and Kings cut a deal on Tuesday that sent veteran forward Garrett Temple to Memphis in exchange for former Kings draft pick Ben McLemore (No. 7 in 2013), plus third-year big Deyonta Davis, cash and a 2021 second-round pick. At this stage of the summer, there’s no trade too small to ignore. Let’s grade the move. This was a shrewd deal by Grizzlies brass, accomplishing a few tasks in one quick swing. Temple is a reliable, well-regarded veteran who offers some shooting and defensive versatility to a team hoping to make the postseason. The 32-year-old averaged 8.4 points on 25 minutes per game last season, and joins new addition Kyle Anderson in a much-improved Memphis wing rotation. Temple is on an expiring $8 million deal and comes at little cost other than the second-rounder the Grizzlies offered up. He’ll help stabilize the rotation at a reasonable price. Moving off of McLemore and Davis as part of the transaction should be viewed a bonus at this point, with the Grizzlies aiming for a playoff return and neither player part of that plan. McLemore, 25, signed a two-year deal worth nearly $11 million with the Grizzlies last summer after leaving the Kings, but has shown little improvement in five seasons and offers little beyond inconsistent scoring and shooting. Davis is still only 21, but his overall lack of intensity and improvement as a finisher were apparent at Las Vegas Summer League, and the presence of newly-drafted Jaren Jackson Jr. limited his relevance in-house. As continues to be the trend with the Kings, this doesn’t make a great amount of sense. We’ll have to see what they do next to better evaluate it, but in a vacuum, they moved a useful short-term guy for two players who aren’t particularly useful in any way right now. There was no explicit need for their roster to get even younger, and neither McLemore nor Davis slots neatly into their rotation. Most notably, this deal opens up another $1 million in cap space for Sacramento, which would suggest another move or two is on the way (they’ll be sitting on about $20 million after the deal goes through). Thinking speculatively, notable restricted free agents Clint Capela and Marcus Smart remain unsigned, though neither is a clean fit other than providing a talent upgrade and making a splash. It would be amusing if they ended up giving an offer sheet to say, Rodney Hood. There’s some dark humor in McLemore returning to the Kings after starting his career in underwhelming fashion there. If Sacramento keeps him, he will end up playing behind Buddy Hield and Iman Shumpert this time around, with his deal expiring after this season. If the Kings also roster Davis, he’ll find himself similarly stuck behind a noted glut of young bigs that includes rookie Marvin Bagley III, Willie Cauley-Stein, Harry Giles and Skal Labissiere. Consider both players immediately expendable. We’ll have to see what the Kings do with their cap space, but there’s no move left on the board that’s an obvious home run for them. So it goes. If the glass is half full, at least the Kings are picking up a second-rounder for an expiring contract in a deal that doesn’t assume any long-term risk.